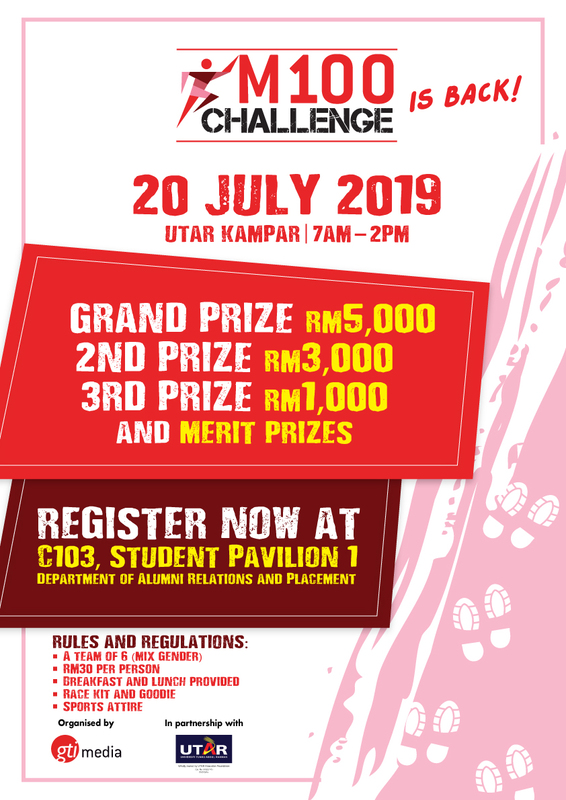 Grab this opportunity to challenge your limits by joining the M100 CHALLENGE 2019 which will be held on 20 July 2019 at UTAR Kampar. The M100 Challenge is an event where employers listed in Malaysia's 100 Leading Graduate Employers will station themselves in different parts of the university and prepare a challenge for the students. The challenge can either be mental or physical, depending on the qualities the employers are looking for. Participants are required to go to each station and complete the task given. The M100 Challenge is a great platform for students to showcase their physical and mental fitness - all while impressing some of Malaysia's 100 Leading Graduate Employers! - Participants must fill up the application form with their CVs attached and full payment. - Participants will be given an event T-shirt on the day itself. - Participants are required to dress in sports attire. - Breakfast and lunch are provided, along with a race kit and goodies.